For chips, the casino used real people, like the ones we meet in Baltimore. These are not the heedless spendthrifts of Wall Street legend, but a high school teacher, a therapist, a minister of the church. They were sold on the American Dream as a safe investment. Too late, they discovered the truth. Cruelly, as African – Americans, they and other minorities were the prime targets for the subprime loans that powered the casino. 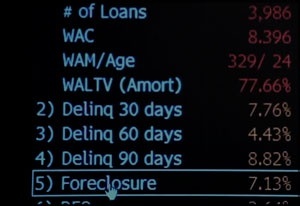 According to the Federal Reserve, African-Americans were four times more likely than whites to be sold subprime loans. We meet the players. A banker explains that the complex securities he designed were “fourth dimensional” and sold to “idiots.” A senior Wall Street ratings agency executive describes being ordered to “guess” the worth of billion dollar securities. A mortgage loan salesman explains how borrowers’ incomes were inflated to justify a loan. A billionaire describes how he made a massive bet that people would lose their homes and has won $500 million, so far. Finally, as the global financial system crumbles and outraged but impotent lawmakers fume at Wall Street titans, we see the casino’s endgame: Riverside, California a foreclosure wasteland given over to colonies of rats and methamphetamine labs, where disease-bearing mosquitoes breed in their millions on the stagnant swimming pools of yesterday’s dreams. 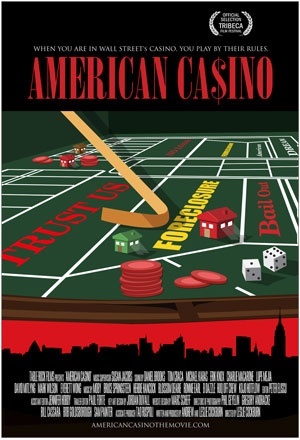 Filmed over twelve months in 2008, American Casino takes you inside a game that our grandchildren never wanted to play. Copyright © americancasinothemovie.com 2009-2019. All rights reserved.